In every wedding, you must see food. I mean, beautiful foods. Not only how we should make it good, but how we arrange the foods so people eager to eat it. 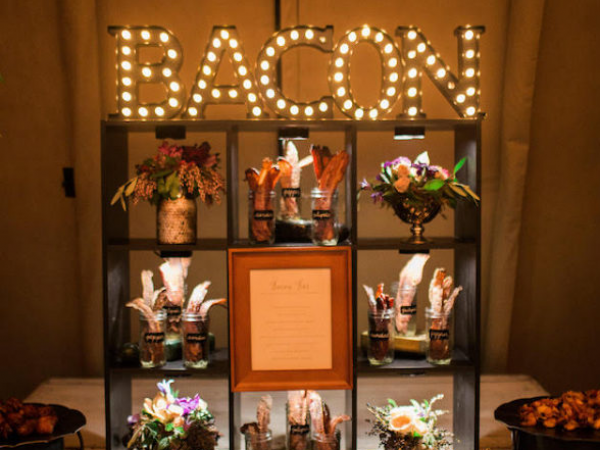 Here are some inspirations for food stall, for you who plan to get married! You see the name. Yes, bacon. So you can show bacons you have here. Who doesn't like bacon? Oh, come on! Choose you favorite bread, choose the jam and butter, voila! Yummy! Are you on diet but don't want to skip foods? Well here thr fruit stall! Vegetarian foods. It's also juicy! Why not?